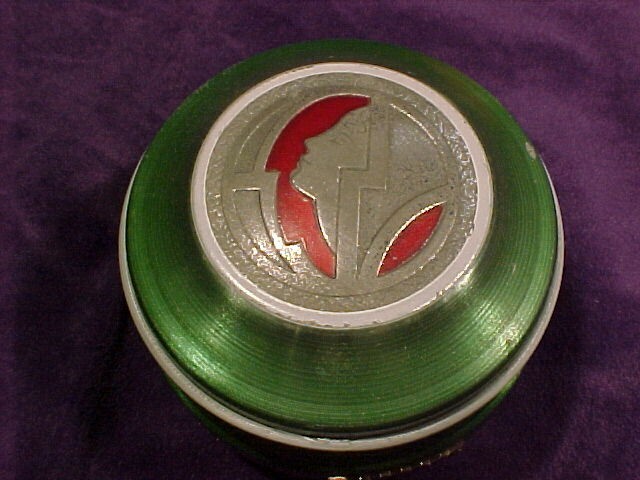 I especially like the embossed framed profile of the woman on the lid that is outlined by red aluminum. The profile and the surrounding deco design has oxidized. 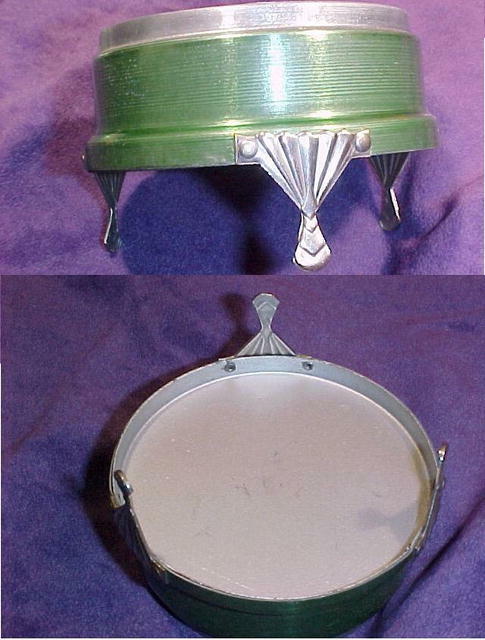 That has resulted in adding to the special charm of this deco era item. There is a wee bit of oxidation in the bowl on the inside. Although I would not consider that a issue. The legs are another perfect example in art deco designing in the way the lines fan out. The legs are what I would call in mint condition. The overall condition of the entire piece is excellent. 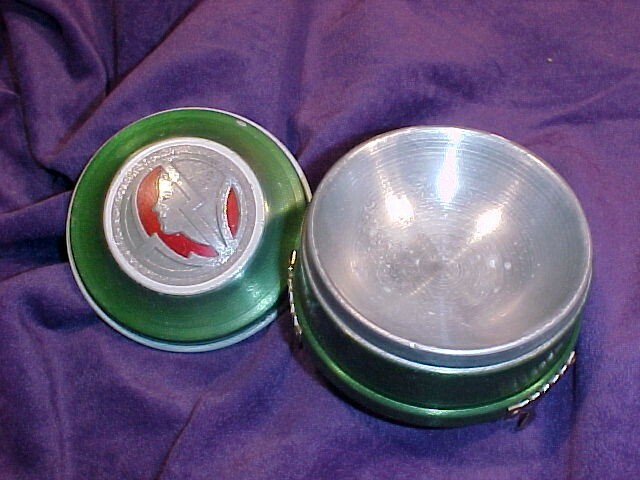 The exception to that is there is about 3 itty bitty specks on the lid where the green coloring has worn off or chipped away. Considering the age of this functional item I would not let those tiny flaws deter from the desirability of this wonder authentic Art Deco Functional Art piece. This most likely was a very expensive piece back in it's day The process for refining aluminum took enormous amounts of energy which not in abundance back then. In the 19th century aluminum production was limit to small items such as jewelery. You will want to bookmark me! Combine purchases and save $$$$ money $$$$ on shipping. 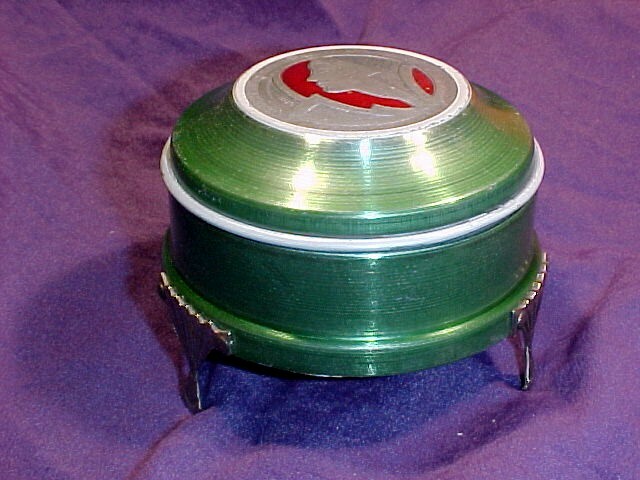 Items Similar To "Art Deco Powder Jar, Green & Red Colored"